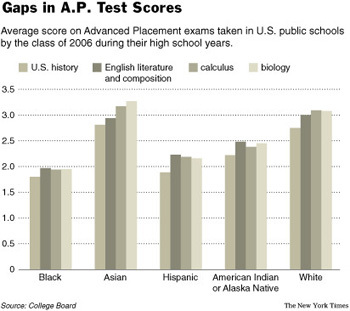 Does Performance by Poor and Minority Students on Advanced Placement Exams Indicate Institutionalized Racism? Issue of the Week LXXII: Does Performance by Poor and Minority Students on Advanced Placement Exams Indicate Institutionalized Racism? A report released last Tuesday shows Illinois is at the national average for high school graduates scoring high enough for college credit on exams, but low-income and black students still lag in performance and participation in the college prep courses. According to an Advanced Placement Program report, 21 percent of the state's high school graduates in Illinois received a three or higher on at least one AP exam, which is typically the score needed for college credit. The national average was 20 percent in 2013. Participation and performance in Advanced Placement coursework is up across the country and in Illinois the past 10 years. "The latest AP exam results are further proof that our efforts are on the right track," Christopher Koch, the state's superintendent of education, said in a statement. For the state's low-income and black students, though, a significant gap remains between those taking the college prep courses and total proportion of graduates. This follows a national trend school officials call an "equity gap." About 47 percent of all high school graduates came from low-income households, while just 29 percent of graduates taking advanced placement tests came from low-income families. Additionally, about 16 percent of all graduating student are black, but they represent just 11 percent of all graduates taking AP exams. Mary Fergus, a spokeswoman for the state Board of Education, said the agency has seen a similar pattern in other data. "Closing that equity gap is a huge issue," Fergus said. Fergus said the department created the Center for School Improvement to support lower-performing schools, which sometimes may include more black students. For the state's Latino students, however, AP exam participation is trending up. Last year, the percentage of Latino graduates taking AP exams surpassed the total percentage of Latino students who graduated in 2013. Koch said this is step forward in closing the equity gap for minority students he says have less access to college. One district in Illinois with a Latino student population of about 60 percent received the Advanced Placement Program's national award for small-size schools. Leyden High School District in the Chicago suburb of Franklin Park was recognized for increasing access to the college prep courses and improving exam performance. Nick Polyak, the district's superintendent, said the success starts with hiring high-quality teachers, but he also noted a laptop program started in 2012 and removing barriers from students entering AP courses. "We're thrilled," Polyak said. "This isn't an award just for our AP teachers. It's an award for every teacher of the kids who have taken these courses." Editor's Note: While the article below is for the performance of high school students in Illinois, it follows a national trend called and "equity gap." reading this article makes me feel stuck, because the article is saying that low income blacks are the ones who are lagging, and it makes me feel stuck because the students can't do anything about the financial situations since they're only students. But maybe it is the teachers' problems, maybe the teachers they have for low income students who can't afford good schools are not sufficient enough, it's a tough problem to solve. i agree because lower income families don't have access to tv and internet as much as those who are more privileged at their schools. not to mention you cant control where you live when you are still a minor and therefore where you go to school. a student is only as good as their teacher. yes the student must apply themselves enough to learn but so does the teacher. What do television and internet have to do with the ability to score well on tests? I can understand that the internet could be useful for studying purposes, but let's be honest, for how many people is the internet their main source of study information? Low income families still have access to libraries; therefor, they have access to books, magazines, computers, and more. Television would only lower test scores, I think. I also don't agree that the student is only as good as the teacher. I have seen a few cases where the student was indeed better than the teacher. I think it is better to say that the student is only as good as he/she applies his/herself. what i mean is that libraries close at certain times. those students may not have access to a car to get to that library due to a lower income. yes, they can use the school library but they close not much longer after school ends. those students may need the internet in order to do homework, which is part of studying. i myself use older assignments and tests to study. as well as i have teachers assign me to watch a certain program on tv and wasnt able to do it because i didnt have access to one; of course i was excused, but it still shows the lack of opportunity i had. with the teacher comment; yes they can be better than the teacher. but what i meant is that if a teacher doesnt apply themselves and teach their subject well, if they dont know their subject well, then a student wont learn as much. For real I do think there in racism inside because why blacks are the ones who suffer from the low performance than the rest. But wonderful enough those blacks-low income are the ones who score low also, this shows this shows that there is discrimination either on economic issues about these people which affect the education system. I have always heard that black students do worse on tests than white students, and this article mentions low-income black students doing worse. However, maybe it is not about race, but way more about income and education opportunities. I don't think a person's race has any affect whatsoever on their intelligence. That seems ridiculously racist to me. Opportunity is what determines someone's ability to do well and succeed. I also believe that this issue is not a race issue as much as an income in relation to education issue. Most likely, some of those low-income black students have not had the opportunities that middle to upper class white students have had. I think people should be more focused on their living environments and not the color of their skin. People in low incomes can afford the extra study tools like flashcards, programs on computers, tutors, books or anything else that could help a child advance in school. Not because they are black but because they have a lower income. I agree, we now know that race has nothing to do with intelligence and that biologically we are virtually all the same. That being said we are dealing with low income African Americans, yet, the article doesn't indicate if we are comparing low income whites/ Asians/ Hispanics etc. as well. That being said we are simply comparing apples and oranges, we can see that the main problem here is that African Americans are more than likely to live in poverty stricken areas and therefor are less likely to achieve the same quality of education. As a result there are less African Americans being able to do just as well as the other races. Not to say their intelligence is lower as I guarantee there are African Americans who excel beyond the other races. But, with a larger population you are going to increase the likelihood that there are brighter students. If for every 20 AP students there are 5 Bright students and African Americans only have 10 AP students in total, that gives them less of a chance to achieve higher scores. This then skews the scores into Asian and Caucasians favor, this being said we can see that this article does not indicate enough information to conclude anything more than the belief that African Americans are more likely to live in poverty (but, even this is uncertain). I have also heard that minority students usually score lower on tests than white students. I agree that the lower scores may be based on their environment. Maybe there isn't any access to supplies they may need or they lack in encouragement, but that doesn't make them any less intelligent. I see this article as being a little on the racist side. I agree completely with what you are saying about race being an option that affects their intelligence. Although I have heard people from an oppressed race have lower intelligence because of how people treat them and how certain stereotypes are associated with race, which may cause a certain person of that race to conform to their stereotype, one of which may deal with their intelligence. But as far as race goes, I think intelligence may have more of an effect when it comes to income and opportunities. It's hard to use standardized test scores as a representation of institutional racism. Most of the content in AP Courses are taught in front of a classroom where the students are of a diverse population. If a teacher lectures, which is probably the case for most AP Courses, how can black/hispanic/etc. students be singled out? It's extremely difficult and If it were taking place, then the teacher would probably be disciplined. I think the biggest problem with the poor test scores by minority populations is that the students' parents are not educated enough to help them study for the standardized tests. I agree on the point that standardized test scores are fair representation of institutional racism. The reason why certain minority groups are less involved in the AP program and receiving lower scores come from the history and is hard to change even though people are focusing on the issue and coming up with different kinds of perspectives. Apparently, low income students have other issues to deal with and have less attention to care for school and test scores. I wouldn't call the trend as an institutional racism, but such equity gap reflects the racism from broad society background. the fact that the equity gap is closing is a great advancement for the AP programs and the problem with low income and/or black students might be stretched as a race/ethnic issue but it might not be related to that. I personally dont think poor performance is based on one's race so much as factors like school incentives, accessibility to resources, support from instructors and families. Maybe the real issue is such students are not motivated enough to do well and the fact that they come from low income families sometimes they work outside of school to support their families which is tiring and stressful sometimes. therefore it's hard to juggle between school and work when one has a family to support, but of course that's just from my point of view since there are students who work and still perform well. I know that in my high school, there were school incentives on certain tests. If you did well you might get to eat lunch somewhere else or get "Irish money" for the school mart. However, it is more important for the incentives to be something that the students would actually be interested. Perhaps a free day off of school would be a good incentive to do well on a test. Thank you for bringing up that point about how students may have to work to support their families. There are so many factors to consider related to this issue. I completely agree. I failed to take into consideration that some students have to support families and work while in school when I responded to the article. Although that is a good point about juggling between school and work, (depending on how much the student is working), sometimes it can actually help their grades if they are busy. I have observed that when students are involved in more activities (unless it is too much to handle), their grades tend to do better, but I could have witnessed more motivated students. I personally did better in school when it was my sport season because I had to manage my time better and focus longer, but I was also motivated. Maybe motivation is lacking in some homes because the students are too overloaded and overwhelmed. I agree that poor performance is based on race. I know in my high school, which was 80% Hispanic, most of the individuals that passed the AP classes and who did extremely well were all Hispanic. I personally did not pass the AP History class that I took and the only guy who did was Hispanic. I think it really has to do with the teachers and how they treat and make the students feel. I had a calculus teacher who only helped the kids who had A's in his class so I got out of it the next semester. I do think it is a positive thing that the gap is being closed though. okay, i agree with you on that. I didn't even think about the students who have to work for their families too. That is a big problem too. Low income families in the black community have less available for them and it shows. We in America believe that everyone is equal and everyone has equal things. My high school for example was a nicer high school in my town but a high school with a higher percentage of minorities had worse resources, worse class rooms, and worse teachers. We try to act like this doesn't happen but it still does and it's not surprising to see these statistics. Morgan Freeman was asked "Do you think that racism is gone?" his response was, "No, the first thing we as people have to realize is that racism is still present." I completely agree with you. People say that racism and segregation is gone, but that isn't the case. Because minorities typically do have lower end job so they live in lower in locations therefore going to a lower end school. Those with better jobs are typically Caucasian people, therefore they dominate the higher end schools and communities. It is often as you said: black families have often less available due to a lower income than other families. This comes visible when conducting data and statistics like the article depicts. There are already actions taken by the government but for racial inequality like this to disappear it will take much more: It is like Freeman said, People like you and me have to realize that not everybody is given the same chance and the same resources to realize dreams. growing up we have no control over where we live and what is offered to us. this all comes from their parents incomes. when they come to the age of employment students of lower incomes usually find jobs. so not only do lower income students not go to the best schools but they also have the responsibility of a job. why do lower income students not take as many AP classes or graduate? they usually quit school and join the work force. many of them are also under the impression they cant do better than the parents have and if their income is any indication of what that is then I don't know what is. however I am happy to see that that is slowly changing. That's a great point that they have to start working at a young age to help support their families, I didn't even think about that. If low income children aren't told that they can succeed do better than their families have, then they aren't given the self-esteem and support to succeed. They aren't given as much opportunity as middle class and wealthy families have been given. Hopefully this can keep changing for the better. I think to one side or another high quality teachers do contribute to the performance of the students and to hire high quality teachers will need huge amount of money because even those teachers knows what they actually posses, so this matter do involve the economic situation, but according to the chart shows blacks are the ones who got low performance than the rest, so this is because they go to the low income schools..so their low performance is not caused by them but the economic problem of their parents, so I think the state have to provide a certain support to them so that to keep their performance high as the rest do perform. I agree. I think teachers are vital to the success of students; however, hiring teachers prepared to educated students at a successful AP level is expensive and the availability of these teachers is limited. I think our educational system would benefit from reforms in the allocation of spending. I think teachers deserve higher pay and all students should be given equal opportunities to participate in these types of classes.